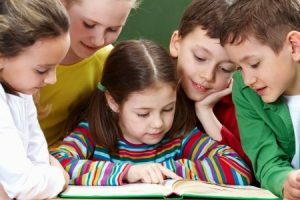 The path for skilled reading development varies some for each child, your child may develop faster or slower than the average reader. If your child deviates drastically from the descriptions below there may be a problem that needs to be addressed. The foundation for skilled reading begins at birth. When we are born we come prepared to capture the sounds that make up the initial language we are exposed to. Those sounds (called phonemes) form the building blocks for the spoken language we learn, and they map onto the written language we will later learn to read. During the period from year1 to around year 3 we learn to speak. Typically, between 4 and 6 years of age, we begin to learn the alphabet. The first skill that is mastered is the ability to recognize and name letters and this is followed by the development of the ability to attach speech sounds to letters. Letter names and letter sounds are often learned at home before the child starts school. Learning letter names and letter sounds typically produces two skills that are critical for normal reading development. The first skill is the recognition that the sounds of the language we speak can be decomposed into individual sounds that map onto the sounds that letters make. The realization that there is a relationship between the sounds making up spoken words and the sounds that letters make is called the “alphabetic principle.” The second skill that must be developed is called phonological awareness. Phonological awareness is the recognition that the words we speak can be broken into individual sounds (phonemes) and these sounds can be combined in many different ways to form other words. So, for example, a 6 year old child who is phonologically aware could tell you what the word “cat” would sound like if the c was removed. The next phase of reading development involves the acquisition of automatic low level skills. Low level skills are letter and word recognition. A skill is automatic if the skill can be performed rapidly without thought. Skilled readers don’t think about letters when they read and they typically don’t think about words (unless they are unusual). When a skilled reader reads all he or she is aware of is the meaning of the words being read. Automatic letter and word recognition is the product of lots and lots of reading practice. Automatic word recognition is also facilitated by the ability to sound out letter sequences so that we can recognize them as words. Some children learn to sound out on their own but others require systematic instruction (commonly called phonics instruction) in how to attach sounds to letters and to then blend those sounds to form words. As reading skill develops, the normal reader relies less on sounding out (a conscious thought process) and more on automatic word recognition. When a solid foundation of automatic word recognition has developed we move into the period where we can readily comprehend what we are reading. Reading comprehension at its simplest is decoding (identifying written words) plus listening comprehension. There is solid research evidence that we activate the speech areas of the brain when we read, and in essence, what we are doing is listening to our selves talk when we read. We don’t realize this because it typically happens so fast that we are not aware of the speech part of the process. However, try reading material that is very complicated in wording or dense in thought and you will often find that you talk to yourself as you read. Reading comprehension is closely tied to learning. If we read text that is about familiar information, we read easily and with good comprehension. When we move to new content though (like reading about molecular biology) we are back to reading comprehension being an effortful process. This means that reading with comprehension can be a continuous process if we are learning new content. The description above briefly describes the development of the normal reading process. There are various places where the normal reading process breaks down and problems in learning to read develop. These problem areas are described in our section on dyslexia information. In addition, the dyslexia information section will describe how the Reading Success Lab Software addresses reading problems that can develop. See if your child’s skills are on target.